The Region 2 North Healthcare Coalition is a multi-disciplinary, multi-jurisdictional organization whose goal is to enhance domestic emergency preparedness for the healthcare community. 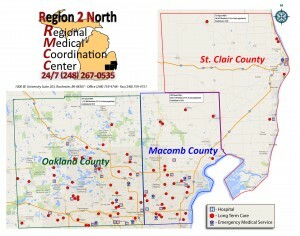 Its partner organizations include hospitals, medical control authorities including their Emergency Medical Services agencies (private and public), health departments, emergency management agencies, long term care agencies, visiting nurse association, the American Red Cross, the R2N Trauma Network, the regional epidemiologist, the Macomb County Public Health MRC, dialysis centers, home health organizations and other organizations and CMS facility types. Region 2North is the second most populous region in Michigan. Its three counties – Oakland, Macomb, and St. Clair – are home to 2.2 million people, several universities and a large business and technology sector. R2N also shares an international border crossing with Canada. Our mission is to work to implement the activities of the national HPP while developing and facilitating a coordinated healthcare response to disasters in our regionor state in an all-hazards fashion while augmenting existing resources and healthcare preparedness to meet the health and medical needs of the community during an emergency.